These are cheap & readily available from the usual sources, but recent reviews indicate that the “metal” base has become plastic and the build quality isn’t anything to rejoice over. My feeling is that if it’s going to become a shop project anyway, I should just conjure something suitable from the heap. The base is a random plastic project box that came with a flimsy sheet-steel top, which I replaced with a rectangle of 0.1 inch = 2.5 mm aluminum plate for more heft. The box is filled with 1.5 pounds of wheel weights, so it’s not going anywhere on its own. The silicone rubber feet probably don’t add much to the project, but why not use ’em? The feed hook started life as copper-flashed welding filler rod, smooth to the thread and pleasant to the eye, sitting in a hole drilled into a stainless steel 10-32 screw. It’s long enough to feed the thread just above the Kenmore’s top surface. A hook works better than an eyelet: just pass the thread over the hook and you’re done. The central shaft is a wood dowel, shaped & sanded on the (metal) lathe, held in place by another 10-32 screw. Inside the spool sits a length of “3/4 inch” CPVC pipe (ID = 0.7 inch, OD = 0.875 inch, gotta love those plumbing measurements) that’s a sloppy fit in the just-over 1 inch spool ID. 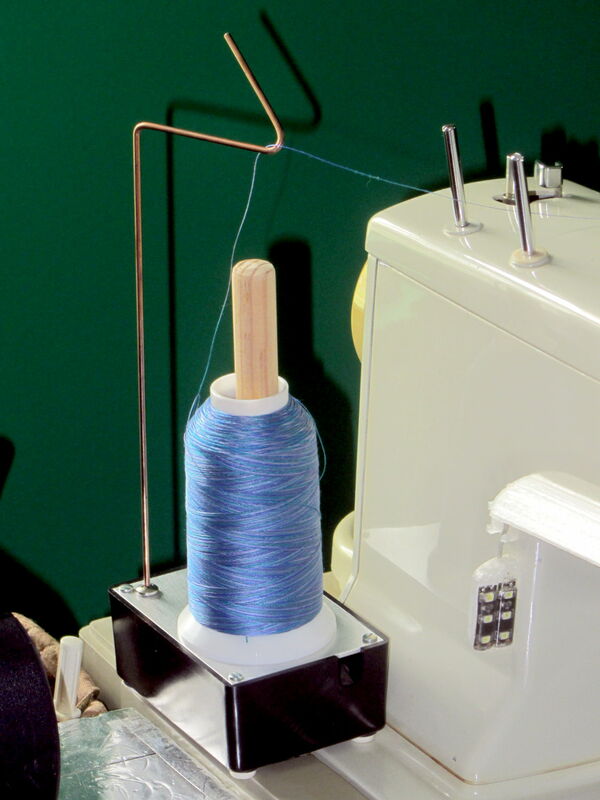 The smaller spools fit directly on the dowel, perhaps atop the CPVC sleeve. This seems to work OK, but I’m going to trim the dowel down to just over the length of the spool, so the thread will feed without touching the wood. I thought stacking the smaller spools atop the CPVC sleeve made sense, but that turned out to not be the case.